The discovery of dinosaur footprints in the Connecticut River Valley may not have been the first ever anywhere in the world, but it is the first documented discovery that led to scientific study of the phenomenon. The first time we know that they were recognized as objects of scientific interest was in 1835, in the town of Greenfield, Massachusetts. A day laborer noticed what appeared to be the imprints of bird feet in a slab of rock he was readying to lay as sidewalk. When he split the slab open, he found the imprints on one side and the raised cast in its perfect mirror image on the facing slab. The laborer, whose name was Dexter Marsh, showed it to his neighbor, Dr. James Deane, who examined and analyzed the footprints. Realizing that the marks must have been made when the rock was still in a malleable state (that is, mud), Deane wrote to two prominent American scientists, Benjamin Silliman at Yale College (in Connecticut) and Edward Hitchcock at Amherst College (in Massachusetts), describing the marks, explaining his reasoning for how he thought they had been made, and eventually including plaster casts and drawings. Hitchcock was dismissive at first, but soon became intrigued, and at Silliman’s urging traveled the 20 miles to Greenfield to see the tracks in person. 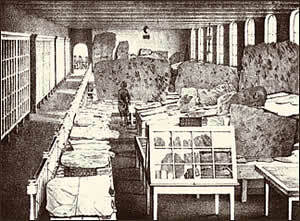 Thus began nearly 30 years of what Hitchcock regarded as his primary original contribution to geology, a field he taught at the college, even though by the end of his life he also had created the first geological map of the Connecticut River Valley, conducted and written the first state-sponsored geological survey of an American state, founded the geological course for Amherst College, saved the college from bankruptcy while serving as president, toured the lecture circuit, founded two museums on campus, overseen the construction of new buildings, and, not incidentally preached sermons (he was ordained as a Congregational minister) and sent numerous Christian missionaries out into the world. This story, and more, can be seen on the Impressions from a Lost World website. Look for blog entries on the history, science, and art of this discovery on the home page of the website you are currently on.